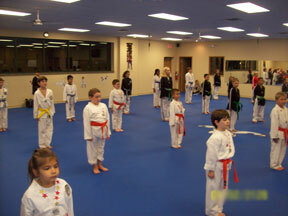 Our Tiny Taekwondo Program is offered to children ages 4-6 years old. During their classes, Tiny Taekwondo students gain basic Taekwondo skills, strength & flexibility while developing the "Yes I Can" attitude. Our Tiny Taekwondo program is designed to foster confidence for younger children through our award winning Taekwondo program. Our students learn concepts that help keep them on track, like FOCUS, GOAL SETTING AND CONFIDENCE which are inherent in Taekwondo training.During classes children gain strength and flexibility.All of our classes follow a proven Taekwondo curriculum which includes: forms (a series of movements), Olympic sparring and self-defense, guiding them towards black belt excellence.In addition to Taekwondo, our students also receive weekly messages and "Life Skills" through stories that help foster positive traits. Adirondack Taekwondo students gain the tools they need to make healthy decisions when confronted with peer pressure. They will be leaders and not followers! One of our Black Belt teens training. In addition to self-defense, fitness is a goal; strength, conditioning and flexibility is an added benefit at Adirondack Taekwondo. With our Taekwondo techniques and training drills every muscle group is defined. Your endurance and stamina will peak as we help condition your body through our teen & adult Taekwondo program. All these physical benefits will be felt in your daily life, increasing your energy and confidence. Call 518.373.0442 or visit our CONTACT US page and we will be happy to set up you and your families lessons today.